Amerks Shutout in Binghamton · Let's Go Amerks! The Rochester Americans were shutout by the Binghamton Devils on Saturday night by the final score of 3-0 in what can be described as another concerning loss. The same line used last Friday when the Amerks lost on home ice to Utica. Binghamton started the game flying and shooting every puck they could at Scott Wedgewood and it continued throughout the rest of the game. The Devils finished the first period with an 18-8 advantage in shots and a 1-0 lead. Blake Pietila scored with 1:56 left in the first period sending a shot into the net glove side on Wedgewood. That would be the only goal the Devils needed to win the game. Scott Wedgewood did everything that he could to keep the Amerks in the game making saves and doing what he could to deflect rebounds into the corners to reduce second or third chances. After a great game on Friday night when Wedgewood had a shutout win against Wilkes-Barre/Scranton he continued to play well on Saturday night. Eric Tangradi scored a power play goal at 10:43 of the third period that took away any chance of a comeback win. A pass attempt from Tangradi behind the net managed to go off the skate of Andrew MacWilliam attempting to block the pass and it went right over the shoulder of Wedgewood into the back of the net. An empty net goal from Nick Lappin with 1:42 remaining in the third ensured the bus ride home from Binghamton wouldn’t be as pleasant. 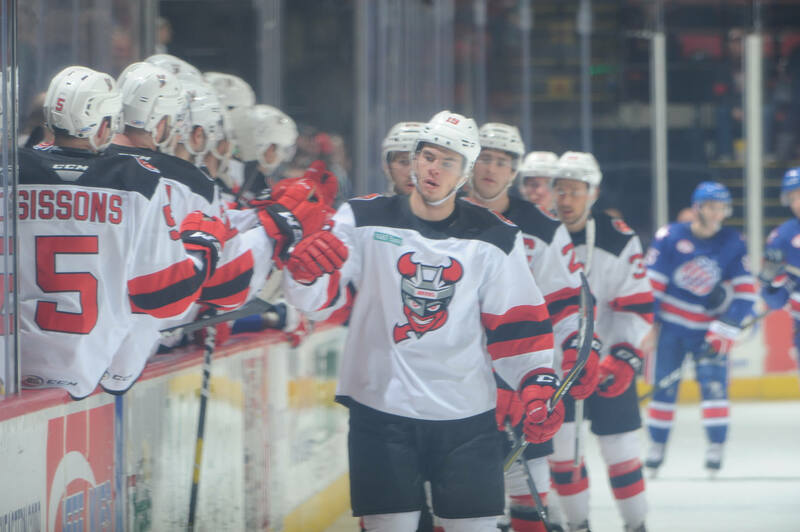 For 60 minutes the Devils were able to shut down every attempt by the Amerks in trying to create any offense whether it was a breakout or simply cycling the puck. Two of the very few scoring attempts were by Will Borgen, the most defensive defenseman on the team. One play he took the puck end to end and getting a shot off on net. Another play was Alex Nylander carrying the puck into the zone and sending a back handed pass to Borgen at the front of the net. It was great to see Borgen with the attempts at offense in a game when no one else was able to do much. Power play struggles continue as the Amerks again went scoreless on the two chances they had on Saturday. The team has only scored power play goals in two out of the last 12 games played. In that span the team has gone 3/43. Two of those power play goals were in the 9-4 loss against Springfield. Binghamton scored on one of their two power play chances, Rochester didn’t score on either of those. Takeaway the bounce off of MacWilliams skate and the empty net goal and that’s the difference. Heading into the game the Amerks were on a two game winning streak. A 1-0 win on Friday at home and 4-3 win last Saturday at Binghamton. The win last Saturday was a bounce back after a bad game the night before. Tonight was a continuation of great goaltending from Scott Wedgewood but unfortunately he didn’t have any help from the 18 skaters in front of him. Two lineup changes occurred in the game. Andrew Oglevie was banged up from Friday and sat the game, Tyler Randell skated in his place. Nathan Paetsch played his first game of the season in place of Brandon Hickey. Paetsch stepped right in as expected and one would have never known he hadn’t played a game since April 25. Amerks return to action at home vs Utica on Wednesday night.